If you have any feedback on the website or general comments, please contact Katie Edwards, Commuications Manager or relevant Centre team members, see details below. 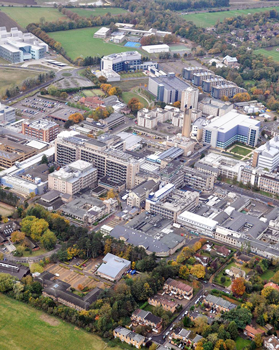 The Cancer Research UK Cambridge Centre is a collaboration of cancer scientists and clinicians who are based at various University departments, Addenbrooke's Hospital, or independent research institutes in the area, so there is no single CRUK Cambridge Centre building. The day-to-day operations of the Centre are run by a core team who have offices in the Cancer Research UK Cambridge Institute, which is located near Addenbrooke's Hospital on the Cambridge Biomedical Campus. The CRUK Cambridge Centre administrative offices are located in the Cancer Research UK Cambridge Institute. 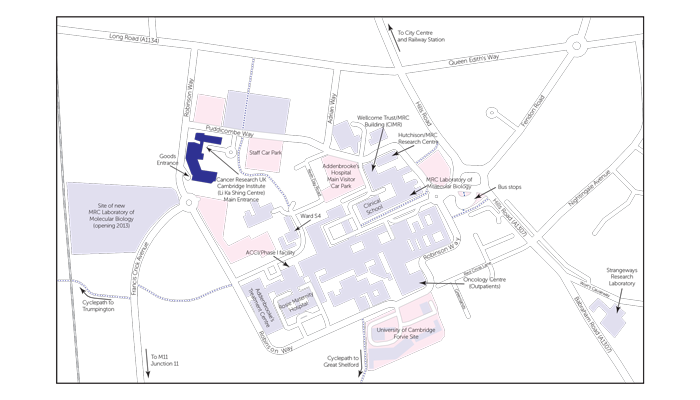 Download a pdf of the map and directions to the Cancer Research UK Cambridge Institute. follow the signs to Trumpington Park and Ride and take the Guided Bus. By air: the nearest airport to the CRUK CI is London Stansted Airport.